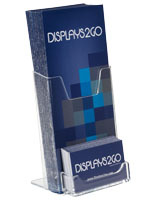 Want to promote your pamphlets on tables, desks, and event booths? 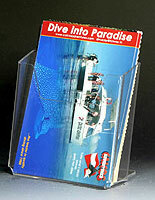 These acrylic countertop brochure holders put print advertisements where passersby can see them. 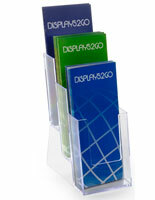 Our see-through plastic leaflet displays visually boost the graphics on pamphlet covers. 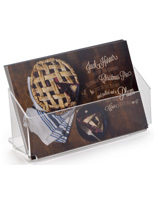 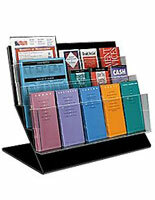 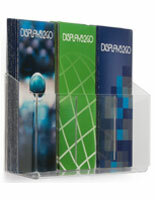 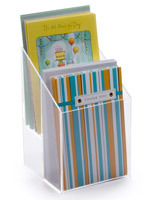 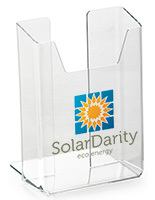 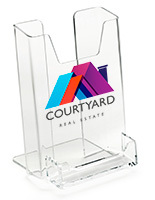 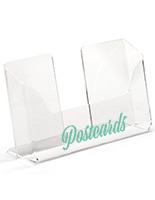 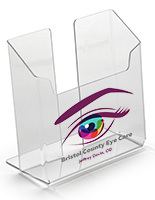 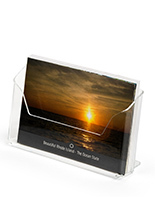 Clear acrylic countertop brochure holders are ideal for getting people to notice your business. 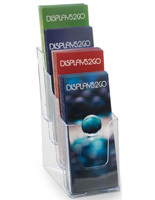 The tabletop literature racks drum up interest by featuring promotional materials on reception desks, store counters, and trade show booths. 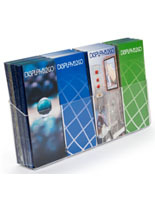 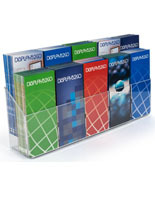 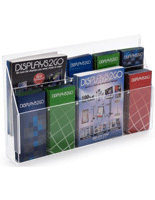 Browse clear acrylic countertop brochure holders with single and multi-pocket designs. 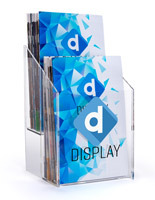 We offer a suite of other features that enhance your print media marketing campaign. 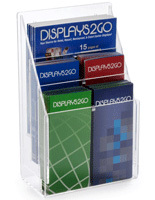 What types of tabletop flyer displays do we sell? 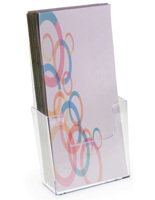 Acrylic countertop brochure holders are available with a choice of modern finishes. 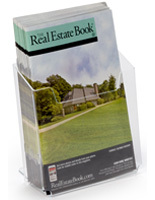 Clear pamphlet pockets have a minimal visual design that boosts promotional messaging. 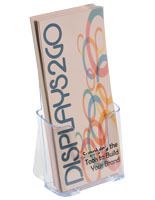 No one will miss your business's graphics with these see-through advertisers! 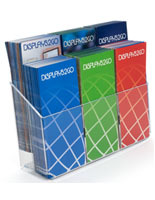 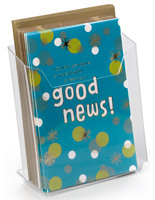 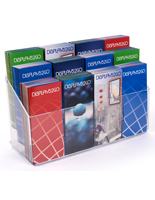 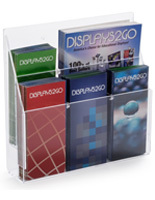 Black plastic leaflet racks have a neutral finish that goes with any ad campaign. 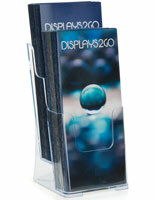 These sleek dark fixtures grab the attention of passersby without distracting from your message. 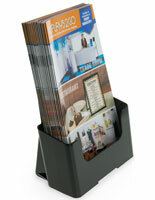 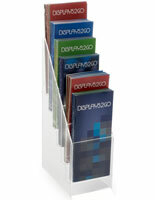 Single and multi-pocket countertop brochure holders let you choose how much literature to show at once. 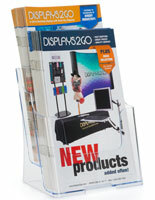 One-slot displays are great for focused marketing campaigns with a single stack of leaflets. 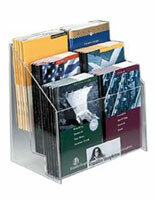 Our tiered literature racks with many pockets can feature as many as 16 different flyers at once. 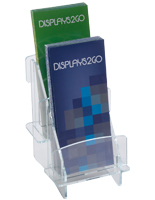 It's easy to accommodate an entire building of different businesses with these organizers placed in the lobby. 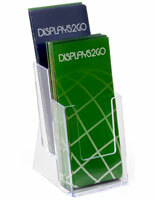 Or, companies promote many services side by side, showing prospective customers all the options. 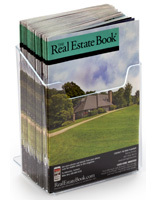 Countertop brochure holders with custom printing build brand presence with professional quality artwork. 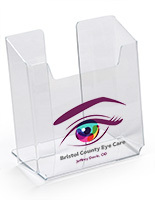 We digitally imprint companies' logos and messaging with vivid detail to give the best impression. 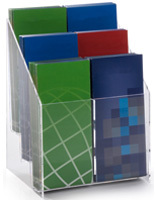 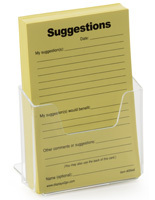 Use full color custom printed pamphlet organizers to increase brand recognition with distinction. 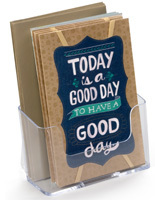 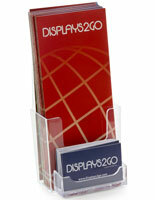 Tabletop brochure holders with sign frames add another element of promotion to your flyer display. 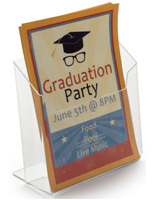 Use your own 8.5" x 11" or 13" x 11" signage to draw more attention to your marketing campaign. 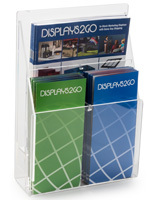 Our floor standing pamphlet racks feature poster frames for advertising with larger prints. 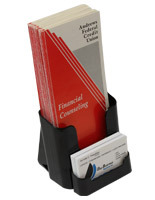 Plastic brochure holders are among the best solutions for promoting printed advertising. 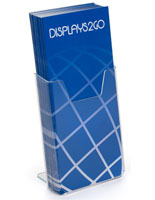 This material is affordable, making them ideal for bulk advertising. 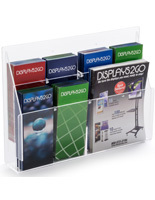 The wholesale brochure holders outfit retail store chains, large medical facilities, and commercial event campaigns. 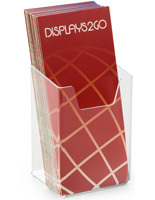 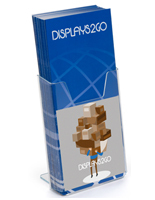 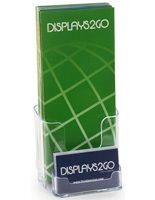 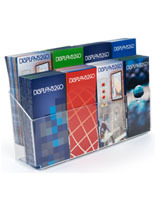 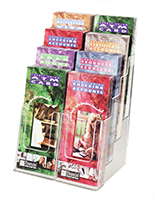 Order in bulk for the best deal on these affordable tabletop leaflet displays.